Back in July 2016, following a review from the Ministry of Defence, David Cameron announced that women would be allowed to apply for close combat roles and tank units for the first time. 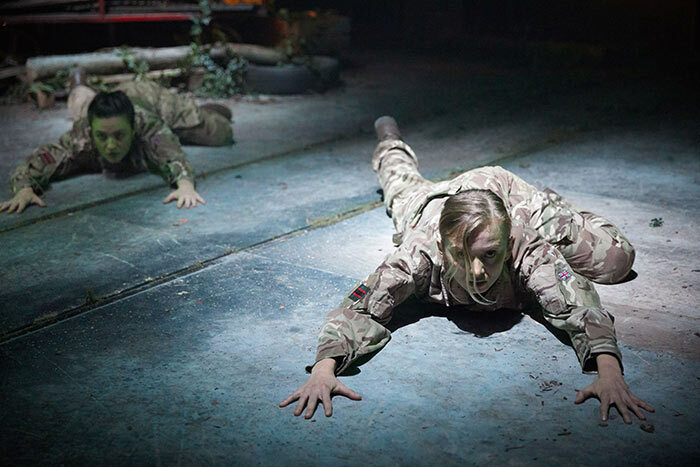 Close Quarters, by Kate Bowen, places three of the first female infantry soldiers – Private Findlay (Adiza Shardow), Private Cormack (Chloe Ann-Taylor) and Private Davies (Sophie Melville) – on the Estonian border in 2022, where tensions with Russian forces are close to bubbling over into armed conflict. 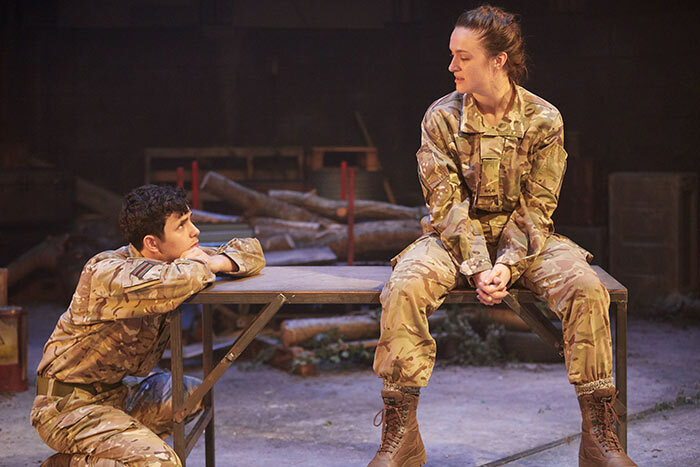 The play focuses on both the external pressures faced by the trio, which manifests itself in repeated hassling from male recruits on the base, negative media coverage and cynicism from their well-meaning but ultimately sceptical captain, while also examining the weighty personal expectations and defence mechanisms employed by each soldier. Findlay is the driven model recruit, determined to be a force in revolutionising attitudes and becoming a roundly accepted member of the team. In fact, being a black woman from the small Scottish town of Greenock, acceptance is something she is all too used to fighting for. Her commitment and evident ability leads Captain Sands (an assured performance from Kathyrn O’Reilly) to insist she applies for Sandhurst and trains to become an intelligence offer, but the clearly ruffled private is more interested in proving her worth for the infantry and being at the forefront of culture change. Cormack has been Findlay’s loyal companion since they grew up together on the same estate, even following her into infantry training and across the planet to a warzone. She shows the risks in displaying any signs of her muliebrity in an environment dominated by men, refusing to report abuse from other recruits, becoming embroiled in an awkward situation with Lance Corporal Armstrong (Dylan Wood) and incurring the ire of Private Davies for making a fateful decision that could cement already abundant preconceptions about women soldiers in the unit. Private Davies herself, a fiery Welsh farm girl, guards from criticism with an outwardly aggressive persona and frequent sexual innuendo that would put many of the male soldiers’ patter to shame. Their Sergeant, John Adeyemi (Bradley Banton), strongly believes each private has what it takes, and as a black soldier in a position of authority, you could surmise that he’s had to face up to prejudice at points in his career too. As a viewing spectacle, it is a hugely energetic, engrossing production. Pumping techno accompanies impressive displays of physicality as the four main characters leap and roll around the well-utilised small set. The main combat scene is intense and taut; a sudden switch from joviality to vulnerability for the soldiers under fire makes for some gripping theatre, made all the more impressive when you appreciate how Shardow had to be drafted in just a day before opening to take on a demanding lead role. It didn’t take long for the audience to forget about the script in her hand and quickly get on board with her portrayal of a likeable, motivated character who towards the end starts to question whether the battle faced against their own military is one that can realistically be won.